Although the season started off poorly for the New York Yankees, the team has turned things around and sits four games over .500 at 13-9. The Yankees have won seven out of their last nine and are beginning to appear to be the team most thought they would be following the acquisition during the offseason of home run king Giancarlo Stanton. As the season started plenty of things were talked and written about when it came to Stanton, Aaron Judge and Gary Sanchez, but little was mentioned about shortstop Didi Gregorius. The shortstop has started the season on fire. Gregorius, who is 28, has a hitting line of .347/.442/.787 with eight home runs, seven doubles and 27 RBIs in just his first 22 games. He is the first shortstop in the history of Major League Baseball to hit at least eight home runs and knock in 27 runs over the first 22 games played by his team. His start is nothing short of great, but not a fluke. Last season Gregorius started on the disabled list, yet finished with 25 home runs, with 15 of them hit following the All-Star break. 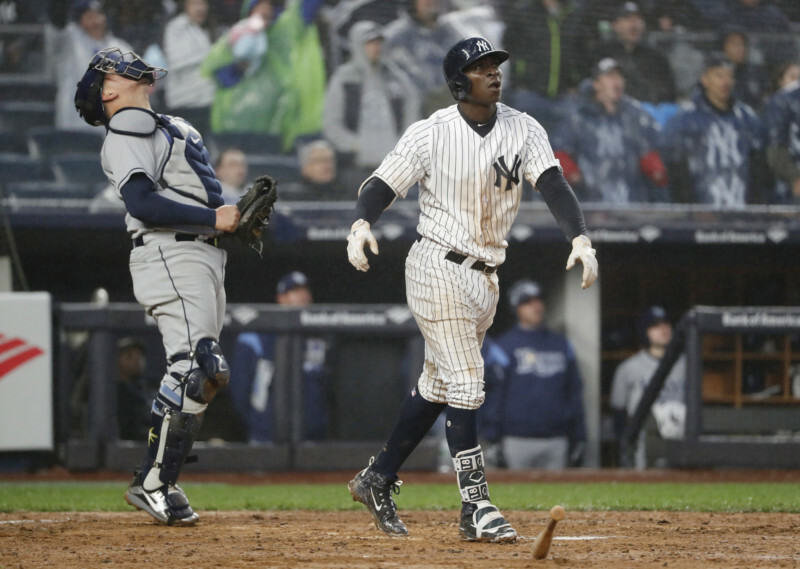 Following the regular season, Gregorius came up big in the Yankees wildcard game hitting a home run and then hitting another two in the team’s upset win in the ALDS over Cleveland. One of the reasons Gregorius has hit so well this season is discipline at the plate. His improvement started during the second half of the 2017 season as he improved when it came to his ratio of walks to strikeouts. In 2018, he has just nine strikeouts versus 15 walks. During the entire 2016 season Gregorius walked only 19 times while striking out 82 times. Gregorius has been helped this season by making good contact and when he does more of his hits are in the air and are being pulled. That works well for left-handed hitters at Yankee Stadium thanks to its short porch in right field. That has paid off for him early this season even though he was and continues to be overshadowed by the other stars in the lineup. Of course, only 22 of the 162 regular season games have been played, but if the start Gregorius has had is a sign of what he can do the rest of the season, he will be setting new marks for shortstops by the time October rolls around.